How thick is your wallet? Mine is pretty big and it gets a little annoying. It’s full of different types of ID cards including membership cards and government id cards. So I was pretty excited to try the app I’m reviewing today. ID Buddy is an ID card manager for Android and iOS. ID Buddy lets you take a photo of the front and back of your id card and also enter basic information such as id number, expiration date, title, alarm, and category. Adding a new card is easy in ID Buddy, you simply click the add button, enter a title and other basic info then choose to get a photo from your gallery or take a photo with your camera. You can store both front and back images. Business users who travel frequently may like the security of having a backup of all of their important id cards. 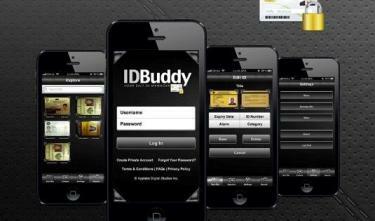 You can easily store your drivers license, Social Security Card, Passport, and much more in ID Buddy. Having the backups could potentially save you much time and hassle if you lose your wallet. Aside from business travel, ID Buddy can be very useful for day to day use. We all have various membership cards and insurance cards which can be stored in ID Buddy. If your photo is good enough, you can scan the barcode on your membership card directly from ID Buddy. Another cool feature of ID Buddy is the alarm feature. You can be notified when your ID is going to expire. Personally I have had quite a few ID’s expire on me…including my drivers license once. Virtual wallet for all your IDs – ID Buddy helps in storing and managing all your identity cards. Keeping track of your records and maintaining your security can be easily done as the app allows you to classify all your government, private, membership, and school identification cards in their respective tabs. ID Buddy Lite is a free version that lets you save up to 5 IDs while the full version lets you save an unlimited number of identification cards. Instant notification – With the app’s alarm feature, you will no longer need to remember the validity of your IDs. ID Buddy will take care of that, and will even alert you when you need to renew your cards. ID manager personalization – Dress up your virtual ID holder depending on your preference. You can change the default black skin color to white or gold to match your taste and personality. Sharing option – ID Buddy allows you to conveniently send a copy of your identity cards to necessary receipients via electronic mail. ID Buddy is available for iOS in both a lite and pro version. Currently it is available for Android in the lite version only.